NETWORK UPDATE: SCORPION and THE BACHELOR each gained 0.1 in final numbers. Elsewhere, USA’s super-sized WWE telecast had 3 of the top 4 slots at 1.41/1.37/1.32 (the latter was an 86-min “hour”), compared to last week’s 1.26/1.24/1.15. On VH1, LOVE & HIP-HOP slipped 0.05 to 1.37, STEVIE J & JOSELINE GO HOLLYWOOD ticked down to 1.09, K MICHELLE MY LIFE lost 0.07 to 0.91, and HIT THE FLOOR was also down 0.07 to 0.62. 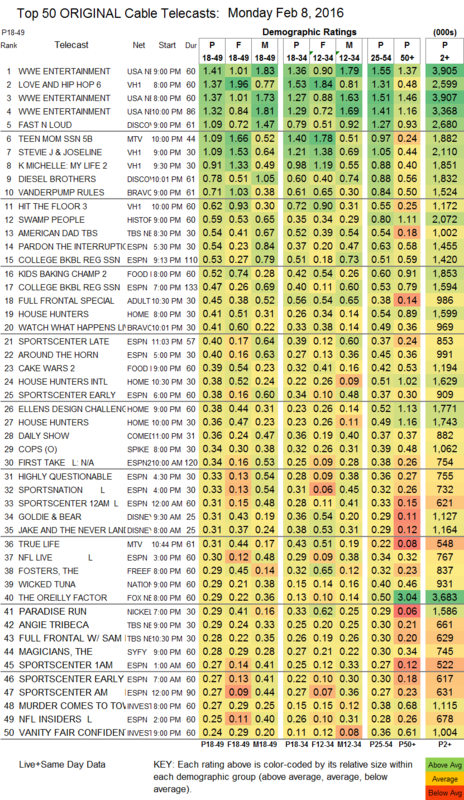 On Discovery, FAST N LOUD gained 0.11 to 1.09, and DIESEL BROTHERS fell 0.03 to 0.78. MTV’s TEEN MOM climbed 0.09 to 1.09, and REAL LIFE was down 0.05 to 0.31. Bravo’s VANDERPUMP RULES rose 0.03 to 0.71. SWAMP PEOPLE returned to History at 0.59. On Food Network, KIDS BAKING CHAMPIONSHIP fell 0.06 to 0.52, and CAKE WARS was down 0.07 to 0.39. An original COPS on Spike was at 0.34. On Freeform, THE FOSTERS dipped 0.03 to 0.29, and RECOVERY ROAD held at 0.18. Syfy’s just-renewed THE MAGICIANS went in the wrong direction, down 0.07 to 0.28, and LOST GIRL was up a tick to 0.12. 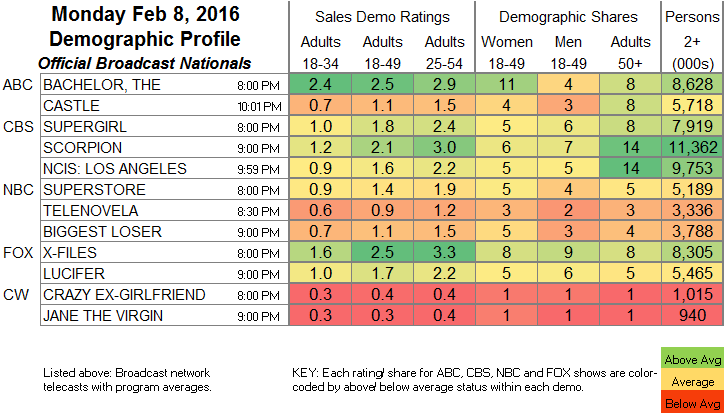 The finale of Lifetime’s WAR & PEACE gained 0.02 to 0.12. HBO’s HOMEGROWN documentary special was at 0.10.